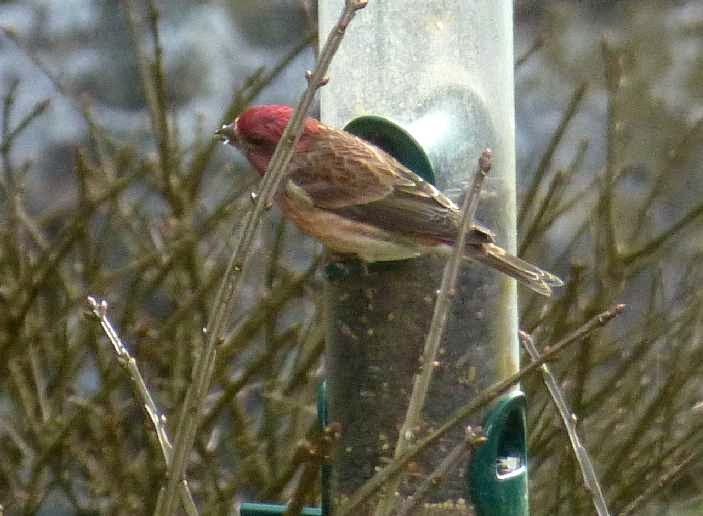 We’ve chosen a colorful fellow to help us wrap up winter and head into springtime in the mountains of Western North Carolina: our March 2015 bird in our 12 Months of Birding at the Inn blog series is none other than the Purple Finch. 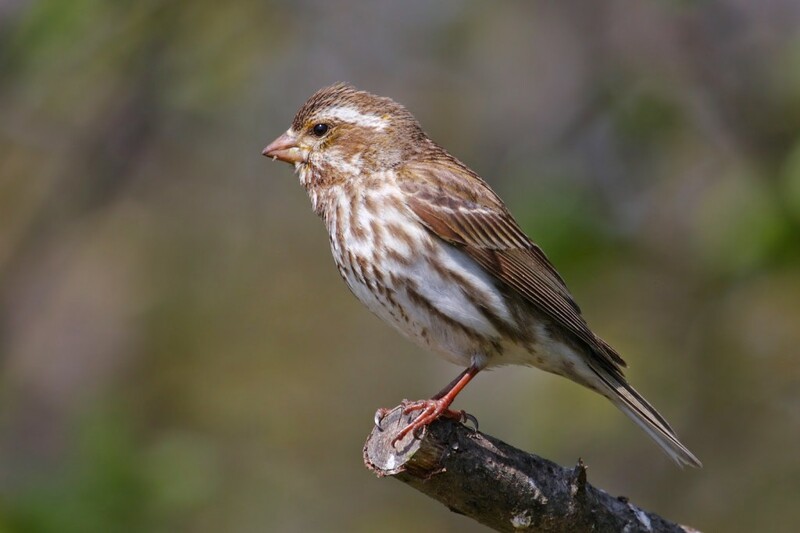 The Purple Finch is a winter visitor to the Inn on Mill Creek B&B, and we typically see this bird most often in late March and early April, during the transition between winter and spring. In the eastern United States, it spends most of the year up north, including summers in Canada. We’re fortunate that they head our way when the weather is colder, providing bold color and a warbling tune in winter when most colorful songbirds have migrated further south. While some finches, such as the American Goldfinch, are vegetarians, the Purple Finch adds a few insects into its diet of seeds and nectar. To identify a Purple Finch, look for the telltale raspberry pink-red hue adorning the head and chest of the male, mixing in with the brown on its back. The female is brown and white, with a strong streaked look. 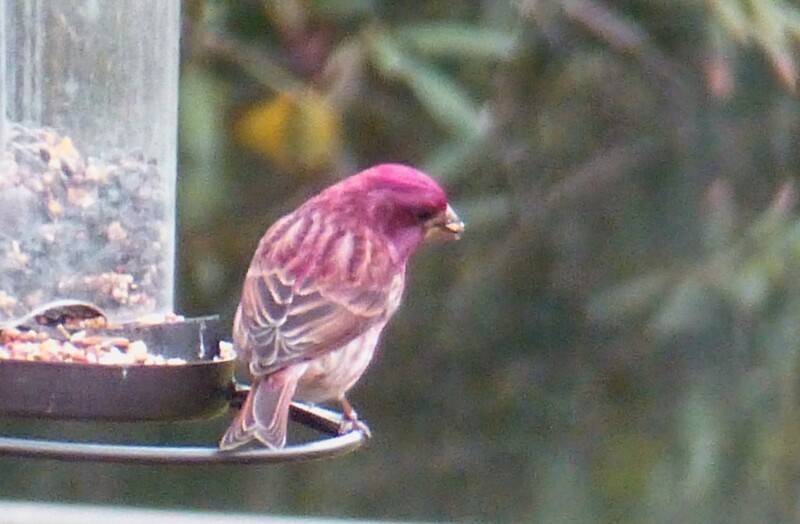 The Purple Finch’s bill is large, short and conical (all the better to crack large sunflower seeds with), and the tail is relatively short and noticeably notched. The notched tail and (in males) the raspberry coloring extending past the nape are good ways to distinguish Purple Finches from House Finches, which are similarly colored. In addition, the underparts of a Purple Finch are less streaky than a House Finch.